Well, um, thank you very much Donald, I guess. I'm sure that was the best of your best words. But the Donald is right about one thing, San Francisco's Cool Ghouls are one of the best indie rock bands in America. They will hit us with a new album called Animal Races later this summer via Empty Cellar Records in the US and Melodic Records in the UK/Europe. Our first earworm is the wonderfully jangling "Sundial". Cool Ghouls are Pat Thomas, Ryan Wong, Pat McDonald, and Alex Feshman. 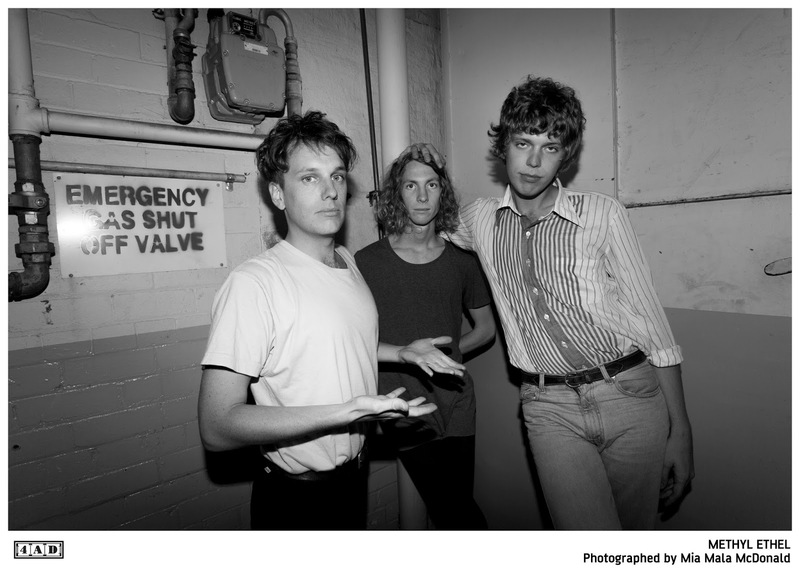 On Oh Inhuman Spectacle, Jake Webb of Methyl Ethel weaves dream pop that doesn't fit the hazy, sunny pop that such term typically calls to mind. Rather, Webb's creations the bedtime to dawn fractured dreams of the over-tired, semi-awake, mentally over-active or fevered. Accordingly, the album cycles through stages of restfulness, twitchy hyperactivity, calm, and tension. The textures are varied, fully detailed and, at times, lush. And such depth may need some time to fully appreciate. When I first listened to this album I thought it was very interesting, with several great songs. After the second listen I upped my grade to "very good" overall. After the third time, I rank this album as one of my top 15 of the year so far, and I'm recommending it to all my friends. Or at least to all my friends that don't think that music stopped evolving with U2, because such people are hopeless. Playing this set of songs from start to finish is like looking through a richly illustrated children's book, with colorful psychedelic coloring, pop ups, hidden sound buttons and playful stories. With some tracks I found myself musing "this could have been on the White Album", and at other times a similar thought about Pet Sounds. Telling you which songs are the best isn't a useful endeavor, as with this album, more than others, it will depend on your taste and your mood at the time you listen. After all, this is an album of moods. But "Twilight Driving" has earned broad recognition at a top track from this album, and I agree with the consensus thinking: It is magnificent. Oh Inhuman Spectacle was written and performed by Webb, with some assistance from studio engineer Chris Wright. For live performances Wright plays drums and Thom Stewart plays bass. The album was released in Australia in 2014, but is now getting a deserved world-wide rollout via 4AD. Funky, ragged-edged rock with a deep groove and a chugging '70s riff. My God, we love this stuff! 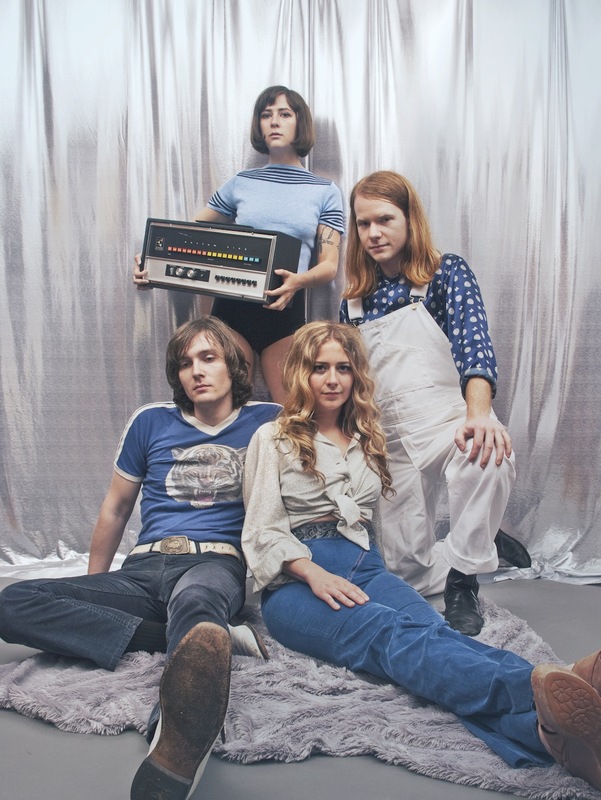 "Souvenir Shop Rock" is the latest gem from up-and-coming Nashville four-piece Savoy Motel. Mining glam, blues, funk, boogie, and garage, and wrapping it up with a free-wheeling vibe, this band's couple of available songs may keep me up for another hour or so tonight. Savoy Motel has one single, "Hot One" / "Souvenir Shop Rock". Apparently, they are paired on a promotional 7" that isn't commercially available. "Souvenir Shop Rock" was just aired, while "Hot One" was getting play a bit earlier. Supposedly both will be on the band's first LP, which will be available later than we wish it were, even if it comes out next week. Which, of course, it won't. Savoy Motel are Jeffrey Novak (bass/vocals), Jessica McFarland (drums/vocals), Mimi Galbierz (guitar/vocals), and Dillon Watson (guitar). California Snow Story was formed in 2001 by David Skirving, who was an original member of Glasgow's Camera Obscura. In addition to Skirving, the band includes Spanish vocalist Sandra Belda Martanez and Japanese keyboardist Madoka Fukushima. The early years of the band featured an EP, and an LP followed in 2007. The band then drifted into hiatus for several years, with occasional shows by no recorded output. The realities of life and living on different continents will do that, but it was unfortunate because Skirving is a talented songwriter, with a knack for penning songs in the neighborhood of the indie pop landscape that welcomes relaxed melodies, gentle hooks, soft male and female vocals, and some tropical, jazz and surf touches. Fortunately, Skirving decided that the project had more life in it, and has released a new LP titled Some Other Places via Shelflife Records. The album features ten tracks of what California Snow Story does so well. The pace is never hurried, the atmosphere is warm and sunny, with a bit of haze and shadings of nostalgia and melancholy. Skirving's songwriting is in top form, and his creations are even more thoroughly adorned as the original band is supplemented with contributions from Melanie Whittle (the Hermit Crabs), Lupe Nunez-Fernandez (Pipas and Amor De Diaz), and Kristoffer Solvang (The Loch Ness Mouse) on various tracks. The entire album provides a perfect soundtrack for a sunny afternoon or an evening relaxing on a gentle breeze. Nevertheless, there are standouts for me, such as the jangling "Our New Sun" and "You'll Go Places" (the latter reminds me of Camera Obscura), the tropical "Outliers", the retro teen-angelic "Over The View", and the closing "Don't Ever Go". This may well be the summer album you need for those unhurried times in your life. It is relaxing and is sure to put a smile on your face and peace in your heart. Some Other Places is out now as a digital download via Shelflife Records. Los Angeles trio Gothic Tropic has just released a pop rock gem that puts them on the WYMA Band To Watch List. "Stronger" features strong vocals and guitar from frontwoman Cecilia Della Peruti, and an aggressive rhythm section in Todd Dahlhoff (bass) and "Cornbread" Matthew Compton (drums). As good as the songwriting is, the star of the show may be the tight performance of the three musicians. There is just enough frayed edge to keep it all from being slick, and that means that it sounds just perfect to our ears. "Stronger" is released via Old Flame Records. We won't bore you with details about this release -- not because we are models of tasteful restraint, but rather because with have very few details. We have a smashing new song for you, titled "Elwood", which is downloadable for free at the Bandcamp link below. What we do know is the name of the band is Savage Mansion. The band is located in Glasgow, and headed by songwriter Craig Angus, assisted ably by Taylor Stewart, Jamie Dubber and Andrew MacPherson. Ah, the evening of the last day of a long holiday weekend. I've just consumed a very refreshing bottle of Einstock Icelandic White Ale brought home by traveling members of the brood, and I crave some laid back music to end the day. Enter, stage right, Stay At Home Son and his recent self-titled EP. The record features four bubbling but chill songs with a melancholy shading and some intriguing details in the arrangements, it relaxes and entertains. It is available in vinyl and digital formats from the Neat Lawn label. Stay At Home Son is Jesse, from Melbourne. We don't know anything else about him, but we like his music. Try out the lead track below, and if you like it stream the entire EP.